Padum usually gets considered only as a stopover during Zanskar trip. People only think of it as that last place in the valley that can be reached by road; and from where, you start your return journey the next day. But is that all there is to Padum really? Most of the Zanskar itineraries I have seen would have a person arrive at Padum from Kargil and be on their way back the very next day. Very few people tend to spend time here because most are either rushing towards Ladakh; or are returning from Leh and now rushing home. I would however highly recommend that you keep at least one day for sightseeing in Padum. There are a few places here that are definitely worth a visit which I will be talking about in this post. Even if it wasn’t for a particular place, the entire town of Padum is very scenically located with all basic amenities available. There are few comfortable and guest houses here where you can stay for a couple of days. It will give you a nice break in the journey that you were on while exploring the beautiful vistas of Zanskar. You can visit the beautiful ancient monasteries, take a walk across the village or just relax at the hotel. However you spend it, staying for a day in Padum definitely comes recommended. Another fact to add here is that pretty soon the road across Shinku La too will get motorable; post which you won’t even have to drive back to Kargil all the way. You can reach Padum via Kargil and drive across Shinku to Lahaul valley. This option is not yet available though and for now, you will have to take the road back to Kargil via Suru valley. The town of Padum is named such after Padmasambhava who was an was an 8th-century Buddhist master. 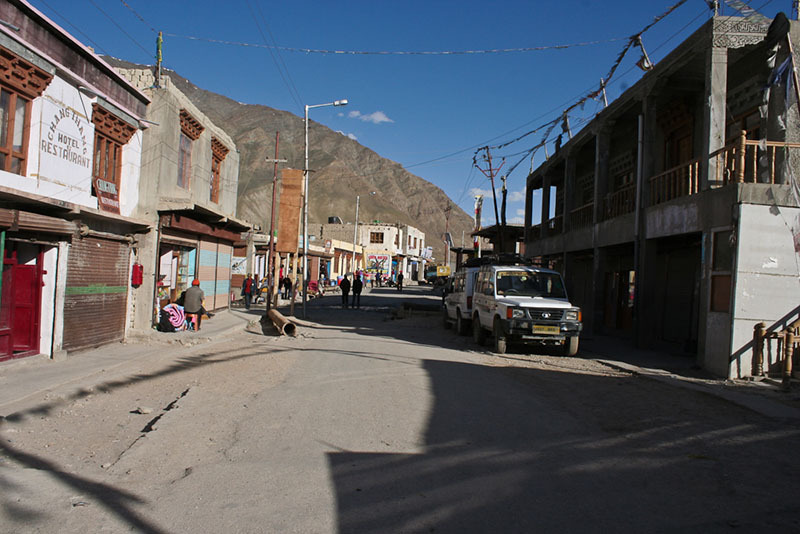 It is the only town and administrative center in Zanskar. Historically it was one of the two main capitals of the Zanskar Kingdom, the other being Zangla; and is now connected to rest of the country via a 240 kilometers link road from Kargil. Once the road across Shinku La becomes operational, it will become the second route to reach Zanskar. People often confused Padum, and the entire Zanskar for that matter, to be a part of Ladakh which it actually is not. Zanskar is in fact a sub-district or tehsil of the Kargil district and not Leh. Below is a list of places that you can visit while staying in Padum. Some of these are with the town itself while others are at a small distance and may require a bit of a drive or walking. I will first list down the places; and then provide a little information about all of them. Let me also provide a brief summary of what these places are and how you can reach here. Located near the village of Ating in Stod Valley, this monastery is famous for murals believed to be painted more than 300 years ago. It also offers mesmerizing views of the valley leading to Umasi La Pass. Foundation of the monastery is attributed to Naropa, a elebrated Indian Buddhist yogi, mystic and monk. Even today, His footprint can be seen in the rock near the entrance to the lower cave. Impressions of Naropa’s ceremonial dagger and staff are also said to be in the rocks in his meditation cave. The total distance between Padum and Dzongkhul is of 37 kilometers which will take you about 2 to 3 hours to complete due to bad conditions of the roads. To get to the monastery, you will first drive back 17 kilometers to Tungri. After the bridge, a road will bifurcate to your left, driving on which you will reach the village after about 20 kilometers. Take at look at Zanskar Valley Road Map to understand the directions better. Considered to be the oldest religious site in the whole region of Ladakh and Zanskar, this monastery is located at a distance of 6 kilometers from Padum in the village of Sani. Said to be founded by the famous Kushan emperor, Kanishka; it belongs to the Drukpa Kargyu school of Tibetan Buddhism, and is the only one of this order in Zanskar which has nuns. There is also a small lake in the village of Sani near the monastery. It is a great spot to sit down and relax for a while. With the mighty Himalayas in backdrop, the lake also offers great photography opportunities. A 35 kilometer drive from Padum will bring you to the village of Zangla; which used to be the second capital of the kingdom of Zanskar in ancient times. The road is mostly good till Zangla and the vistas too are stunning. The three-storey palace of Zangla is mostly in ruins now and sits on crag surveying Zangla village and the valley. It is a good spot to catch sunrise or sunset views if you stayed for a night at Zangla Village. Since there isn’t much tourist movement here, the fort mostly remains locked and its keys remain with the headmen of the village. Don’t forget to take the keys before you climb up the stairs to the fort. There is also a popular tourist spot on the way where Zanskar river takes a complete U-Turn. Located approximately 12 kilometers from Padum towards Reru, it is a 17th century monastery. The location of this monastery is quite scenic, on a huge rock right next to the river. The monastery consists of a large Dukhang or assembly hall which has some grand statues of Buddhist figures and several small stupas in clay, bronze, wood and copper. Karsha is the largest and the most important monastery in Zanskar. It is directly under the control of the younger brother of the Dalai Lama. There are ancient rock-carvings at the site and the several wall paintings from 958-1055 AD. It also houses the relics of Dorje Rinchen. 100 monks reside in this monastery. The popular festival held in the monastery precincts is called the Gustor festival, celebrated between the 26th and 29th day of the sixth month of the Tibetan calendar, when events such as the sacred masked cham dance take place. Rafting facilities in Zanskar River are available in the village at the base of the monastery. This is another ancient monastery located near the village of Pibiting, on the road towards Hanumil. The confluence of Zanskar and Lungnak rivers at Pibiting too is a beautiful sight. Also known as Stongde, Stongday, Tonday or Thonde, this monastery is located approximately 18 kilometers from Padum on the road to Zangla. It is believed to be founded in 1052 AD and is the second largest monastery in Zanskar. The monastery also provides accommodation for tourists in case you would like to stay here for the night. It is located at a stunning spot proving a 180 degrees view of the entire valley around. Also known as the cave gompa, this monastery is an almost 4 to 5 hour walk from the village of Anmu. It is a 14th century monastery famous for 700-year-old mural fragments in the Alchi style. The view of the surrounding valley from this monastery though are its greatest appeal. This monastery also offers rooms for rent so you may trek there, stay at the monastery for the night and return to Padum the next day. And that is it. This is your list of some must visit places during your stay in Padum. All these can be covered in a couple of days of stay unless you plan to trek to Phugtal Monastery which would then take a couple of days more. Even if the idea of visiting a monastery did not interest you, it is the drive to all these places that definitely will take your breath away. You will explore through the beautiful Zanskar valley and see all that there is to see. Even the location of some of these monasteries is at a quite stunning location. Padum is the headquarters of Zanskar Valley and thus the most developed town in the region. Here you can find a phone booth, internet cafe, variety of restaurants, hotels, and guest houses. Mentioned below are names and contact information of a few hotels in Padum in case you would like to call and inquire in advance. Most hotels close from Late October to June, except when booked in advance for winter trekking groups. There is also a camping ground in Padum, opposite Tourist office. Mont-Blanc Guesthouse – Phone : 01983 245183. Price can be anywhere between Rs. 300 to Rs. 500. Phukhthar Guesthouse – Phone : 01983 245226. Price range close to Rs. 500. In case of medical emergency, only hospital in the region is Community Health Center in Padum. The hospital surprisingly is well equipped considering the location. Only BSNL / MTNL postpaid phones will have connectivity in Padum; rest all the network will not work at all. There is also a phone booth in Padum from where you can make STD / ISD calls. Only bank in Suru and Zanskar too is in Padum, a J&K bank branch but no ATM. Kambhir is a local Zanskari Roti made out of wheat and eaten for breakfast. While you are here, it is one of the dishes that I will recommend trying. It is mostly served with team and some Jam and Butter. Ask your hotel owner about it and they will gladly serve. I hope the information I provided above on sightseeing in Padum and availability of other facilities was of help. If you have any questions; or need any further details; please feel free to ask in the comments section below; or at our Community Forum; and I will be glad to answer.